Would you like to add content to the USAID RM Portal? First, you must be a member of this portal to add, edit, or remove content. To become a member, contact the portal administrator info@rmportal.net. Then login to the portal. Next you must go to the place where you want your content to appear. 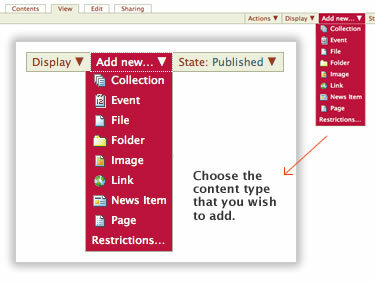 A general overview of how to add new content items in the USAID RM portal, including definitions of each standard content type. For more information read the Portal User Guide. Adding content in the USAID RM portal is done placefully, which is to say that you must navigate to the section of the portal that you wish the new content to reside before you use the Add New drop-down menu. You can of course cut, copy, and paste content items from one section to another if necessary. A Page is one of the most simple content types available. Use Page to create a web page. A File is any binary file you wish to upload with the intent that it can be downloaded by your site visitors. Common examples are PDFs, Word Documents, and spreadsheets. Folders work much like they do on your computer. You can use folders to organize your content. The Image content type is used for uploading image files (JPG, GIF, PNG) so that you can insert them into your webpages, news, or other page-like content types. The Link content type is often used to include a link to an external website in Navigation and other specialized uses. A News Item is specifically for posting news. You can also attach a thumbnail image to a News Item, which then appears in folder summary views next to the summary of the News Item. An Event is a special page-like content type specifically for posting information about a group event (such as a workshop or meeting). This content type has a function which allows the group members to add the event to their desktop calendar with either the iCal or vCal standard. This includes applications such as: Google Calendar, Outlook, Sunbird and others.